Pigzbe is a fun, handheld home for your child’s digital pocket money. Get notified of new allowances, tasks and rewards and unlock new knowledge to learn as you earn. The Pigzbe App lets the whole family send money to your child’s Pigzbe from anywhere in the world, instantly and securely. For kids, the App is a playful interface for more advanced activities, like setting savings goals, learning about budgeting, sharing and spending. For parents, Pigzbe is an easy way to engage with your children’s financial education. Invite other family members and friends to join in the experience, using the blockchain to send as little as 5 cents from anywhere in the world, safely and securely. 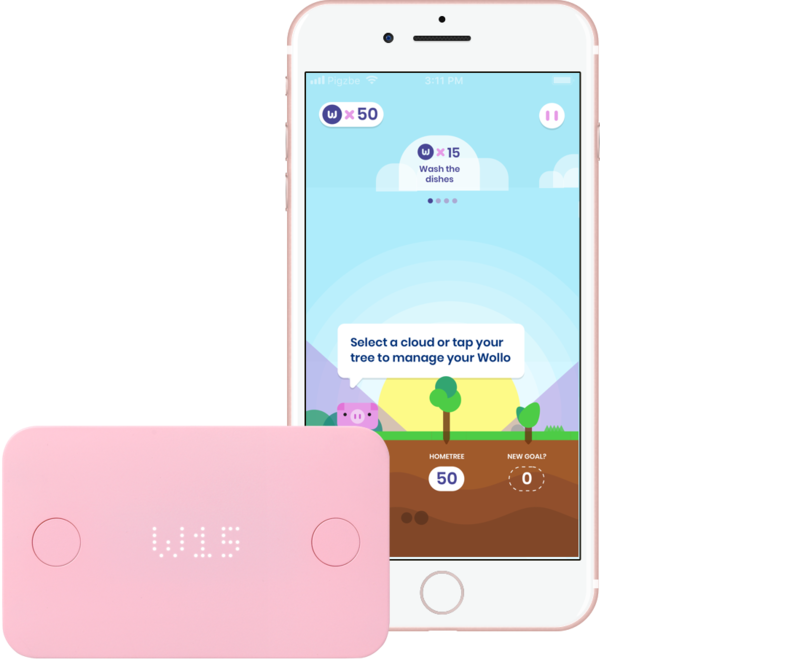 Pigzbe runs on Wollo, a new digital currency designed to make learning about money playful and fun. 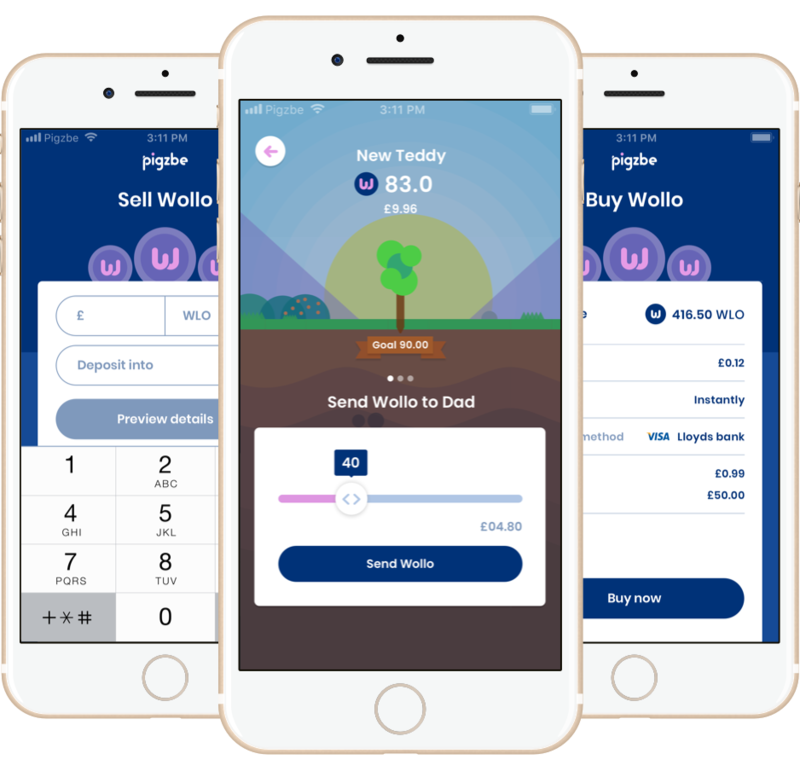 Buying and exchanging Wollo is simple using the Pigzbe App. Just top up your Wollo whenever you need to send your child pocket money or a gift. And when a savings goal is reached, it’s easy to change Wollo back into every day money. Pigzbe is now live on Indiegogo! Act now to snap up a 20% discount off Pigzbe’s $129 retail price and some special rewards! Earn and save - With tasks and chores, work towards savings goals for the things you really want. Spend and share Once you’ve reached your savings goal, spend your money in the real world with approval from Mum and Dad. Visualise and exchange - Pigzbe lets you visualise pocket money in a whole new way, in a range of currencies, to stay on top of what comes in and what goes out. Set tasks and chores - Teach responsibility by setting chores and tasks through the App for your children to complete. Create a family network - Invite other family members and friends to join the experience anywhere in the world! Managing money is a basic 21st century literacy, that our children can't afford to miss out on. Good (and bad) money habits are formed by the age of seven. Financially literate children become financially capable adults. Interactive - 6 axis motion control and dual button game controller. Multimedia - LED matrix, vibration motor and speaker for tactile feedback. Forbes 30 Under 30 2017 Alumni, co founder of Primo Toys and creator of Red Dot Award Winning and Montessori approved Cubetto, a coding toy sold in 100+ countries. 10+ years across operations, design, strategy and innovation. Adam has led teams at Native Design and Method Inc, working for companies such as Bowers & Wilkins, The Economist and VEON. Designer who has worked on some of the world's most innovative connected products like the Kano Computer, the Kano Pixel Kit, and the SAM Labs IOT system. Jon is also a partner at Pentagram Design. Experienced technology executive. Previously Head of Technology at Finalogic, Tribe & Sapient, and as an engineer at ABN Amro and Betfair. Experienced engineer. Previously developer of hardware and firmware for some of the world’s most exciting projects, including those for NASA, Google and Primo. Brand & digital strategist with 20+ years of enabling growth for scale-up businesses. John is also co-founder of award-winning agency Structure. A multi award winning designer with 15+ years experience leading teams to solve problems for some of the world's biggest brands, including: BBC, eBay, Unilever, Coke Cola, O2, ENBD Liv. Siemens and Nike to name a few. 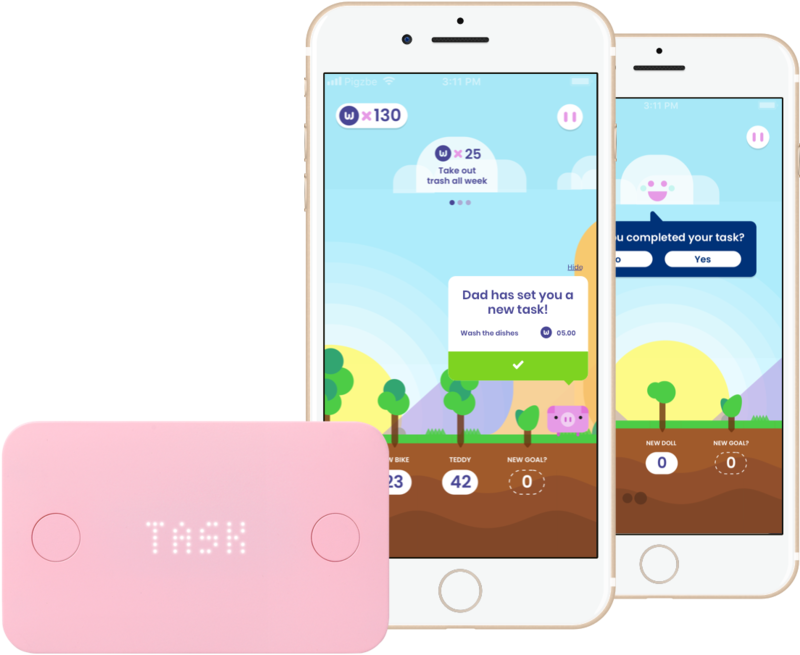 Pigzbe is a friendly financial assistant that uses digital pocket money and gamification to create valuable (and playful) tangible learning experiences. Pigzbe is comprised of a hand-held ‘piggy-wallet’, an educational app and a new digital currency (Wollo). Together these elements teach children age 6+ the building blocks of modern money management, including saving, earning, budgeting, exchanging, spending and sharing. 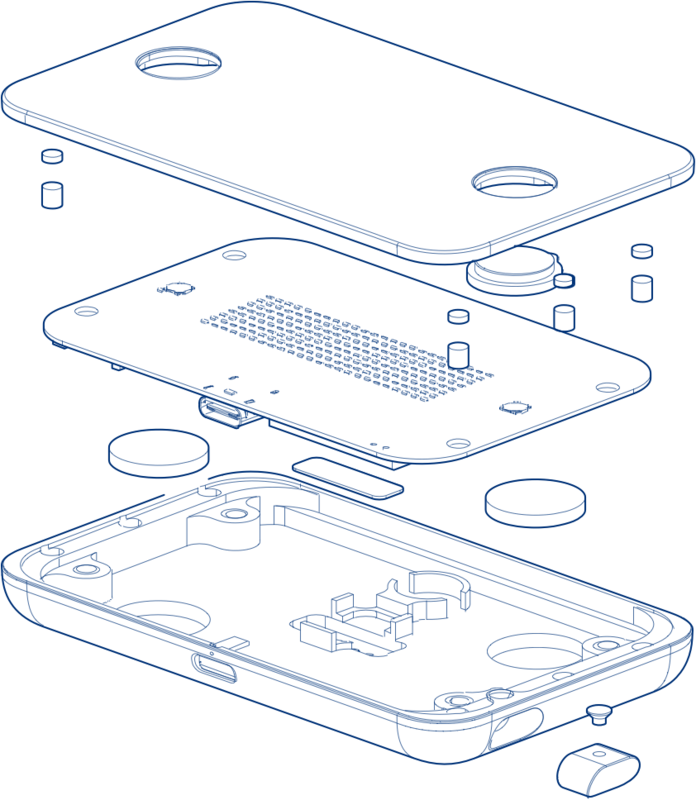 What ages is Pigzbe suitable for? What kind of product is this? Pigzbe is an educational technology (edtech) product. It’s designed to help kids around the world get confident with earning, saving and spending using digital money in the real world. 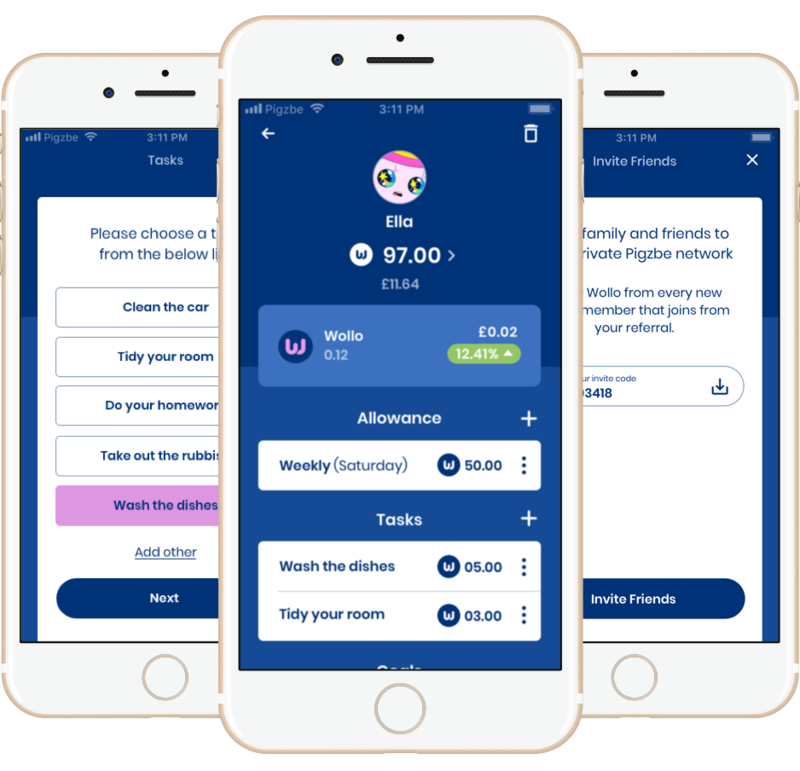 Parents use the Pigzbe App to transfer digital pocket money to their children in the form of Wollo, our new educational currency. With the App, parents can also set up tasks, send gifts and suggest goals. 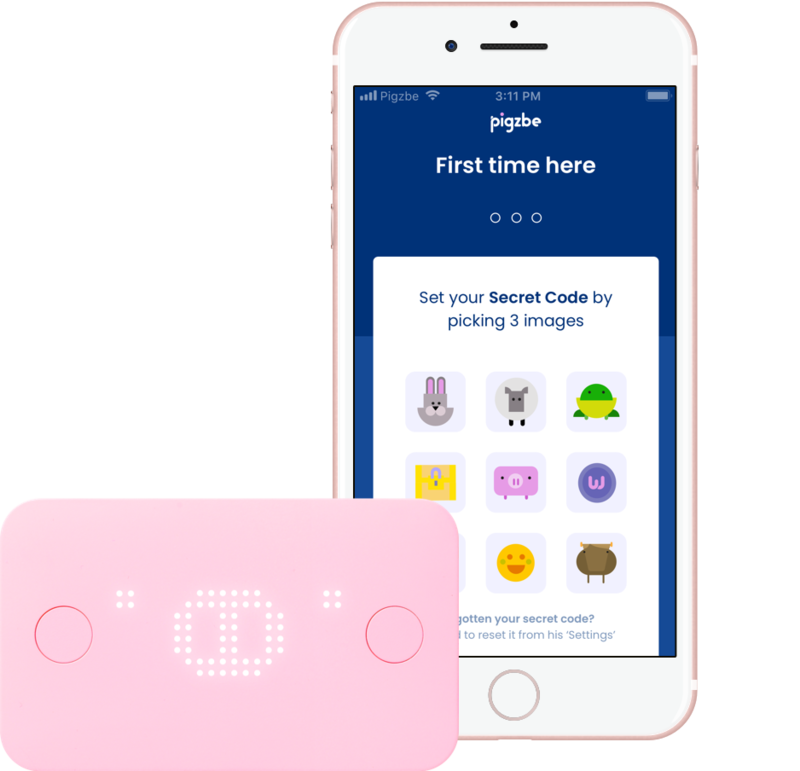 Children get notified by any new transfer, task or gift via their handheld Pigzbe device. Rich in haptics, visual and audio feedback, it works as a tangible home for their Wollo. The children’s App is an adventure that enhances the hands-on experience, helping children learn through connected play. Through the App, children can also set saving’s goals for the things that they really want. Once they have enough, they can spend their Wollo in the real world by converting it back into everyday money. Can you really teach children financial literacy? Absolutely. Cambridge University research shows that good – and bad – money habits are learned by the age of seven, and that kids can understand the concepts of price and value as early as age five. Good financial education can teach children to defer gratification, and become better at saving and looking after their money. We know from experience that the earlier you teach kids a skill, the bigger the impact later in life – financially literate children become financially literate adults. Pigzbe is here to help. For generations, pocket money has been a brilliant way to teach children about finance. Do chores, receive coins. The child learns how to save these coins, spend them or earn more. But today the world is digital, and so is money: Dollars, Pounds, Bitcoin, Wollo… Loose change is often impossible to find, so chores and tasks go unrewarded. The lesson is lost. The Pigzbe App makes it easy for parents to send very small amounts of money to their child’s handheld Pigzbe device in seconds, anywhere in the world. I want to learn more - how do I talk to the creators? If you backed the project, you can also leave a comment in the comments tab. 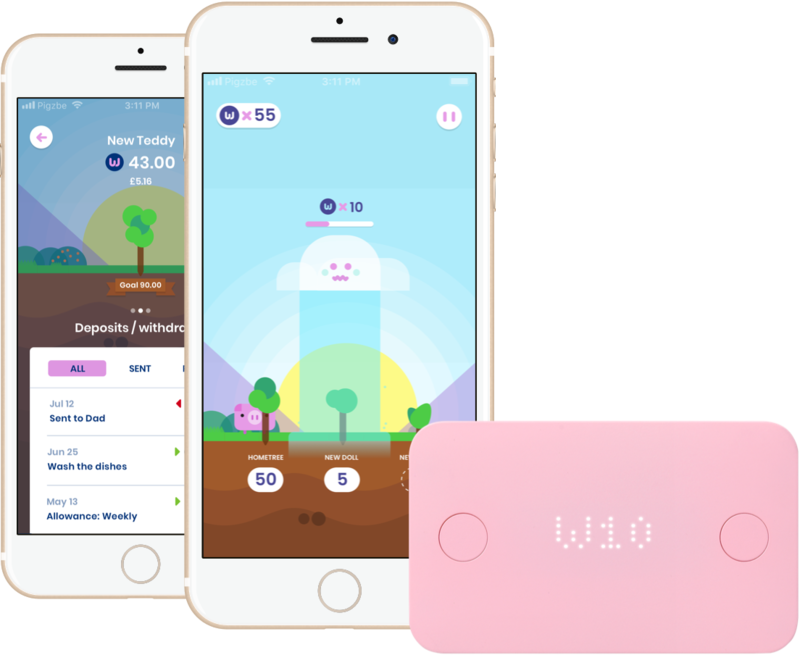 Wollo (#WLO) is a digital currency designed to help kids learn the principles of money, safely and securely with the Pigzbe App & Device. Wollo is a payment token for families that has been built on the Stellar blockchain. If you don’t know anything about blockchain it’s a system designed to allow money to move around the world quickly and easily without the need for a central institution (like a bank) to keep track of everything. At its heart, Wollo is designed to be a secure solution that helps modern global families send money anywhere in the world quickly at almost no cost and spend it as easily as local currency in their local community. Really it’s that simple. Why do you need to use Wollo with Pigzbe? Makes it quick to transfer small amounts of money: 50p for making the bed, a dollar for doing the washing up, a gift for your niece on their birthday or a contribution to that new bike. The current banking system makes it difficult to send small amounts of money without paying huge charges. We wanted to give families the power to send allowances from anywhere at almost no cost. With Wollo you can. Connects families across borders: From uncles in Uruguay and aunties in Albania to the grandparents in Greece, Wollo let’s overseas relatives and trusted friends join in a child's financial education in a personal way regardless of age, location or financial status. Reinforces good behaviour with instant rewards: - Sending Wollo to a child takes only 3 to 6 seconds once a task or chore is completed. Never be caught short for cash again and make sure that good behaviour is rewarded instantly, developing and reinforcing good habits. Works exactly the same anywhere in the world: Pigzbe is global platform and we wanted the saving and spending experience to look the same for kids no matter where they are growing up. 1 Wollo is 1 Wollo everywhere. But why not just use a real currency in the App? It’s quick, cheap and borderless – Because Wollo is based on the Stellar blockchain, transfers are a fraction of a cent and take as little as 3-6 seconds – far it’s quicker and cheaper than using traditional banking or money transfer platforms. It also means that family members in other parts of the world, can transfer Wollo without any hassle. Again, this wouldn’t be possible with incumbent systems. It’s easy to understand – Based on years of experience building educational toys like Cubetto and the Kano Computer we’ve learned the importance of doing things in a language that kids understand. Wollo works in simple denominations without decimals, which kids typically don't learn about until aged 8. Wollo is universal and works exactly the same for any child anywhere. It’s important to teach children about digital money – We believe that the future financial landscape will be made up of tokens and regular (FIAT) currency. Wollo is a safe and secure way to introduce children early on to codified finance. Is it not risky for my kids to be exposed to this? Kids today are growing up with the concept of digital currency as a core component of their reality. We believe that today’s children will grow up into a world where digital currencies like Wollo are the norm and cash is increasingly rare. We believe that children who aren’t introduced to digitial currencies early on will be at a disadvantage later. We built Pigzbe to help teach kids about this new world so they are well prepared for the future of money. But how will I spend Wollo? You will be able to buy Wollo and exchange them for other digital currencies online, through exchanges like StellarX or Wirex. Both of these provide wallets which let you buy, store, exchange and spend crypto and traditional currency. Once you have purchased Wollo you can transfer them to and from the Pigzbe App super easily, in a matter of seconds. We are also working to make it possible to purchase Wollo directly through the Pigzbe App. Our partnership with Wirex will make it easy to spend Wollo in the real world. Using the Wirex VISA card you will be able to spend Wollo anywhere that takes VISA (additional fees apply for the card; available in a growing number of countries – see existing coverage here). Indiegogo is one of the world’s largest crowdfunding platforms for creative projects. These can be films, books, games or inventions like ours. Indiegogo allows us to continue to raise funds and build our backer community following the completion of our original crowdfuning campaign which started in December 2018. What do you mean by backing? When you back a project, you’re pre-ordering the product. That means you'll get it once it's produced. Besides getting the product itself, you’re also joining a community of like-minded people who want to share their experiences. You get to follow along with the production process, take part in important surveys and give the creator valuable feedback, all the way from initial design to delivery. Why should I back a project on Indiegogo? Backing a project on Indiegogo is different to buying a product online in a few (pretty awesome) ways: you'll be the first to get it in the world, guaranteed; your feedback will help shape the product; plus, you'll get it at a discounted, Indiegogo-only price! What’s not to love! OK, I'm convinced - how do I back Pigzbe? In order to back, head to our Indiegogo page and click the button that says “Back it”. On the following menu, you'll choose your pledge level & desired reward. At this stage, you’ll also have to select a country for shipping and add the shipping rate, if applicable. When the campaign ends, you'll get a survey to fill out your shipping address, desired rewards and more. Sign-up to receive the latest Pigzbe news and product development updates!